It’s Holiday Season and to celebrate with our loyal followers we thought it was time for another fabulous Facebook Fan Exclusive Giveaway! Get a $25 Restaurant.com Gift Certificate for just $2 + Free Gift with Purchase! Thanks for the contest I LOVEAmazon!! Winning would mean a lot to me. Love Amazon & Love Dealectible Mommies! I would love to win this, it would be so helpful for Christmas. Thanks! Love your blog! I would buy my son some wooden puzzles and a Mickey Mouse stuffed animal. I love Amazon. Makes life so much easier being able to order items online. Also, the prices are usually the best. I buy everything from Amazon from presents to household items to dd’s allergy meds! This would come in handy! wow, sounds wonderful, I love Amazon. This would put a dent in my holiday shopping. What an amazing giveaway for the holiday season! Thank you!!!! I shop on Amazon all the time! Thanks for the giveaway! thanks for the great, and timely giveaeay! I love Amazon and this would be wonderful to win for some much needed extra cash for Christmas. Thank you for the opportunity. I could sure use this for several items on my Christmas shopping list! Great contest. Thanks for having it. I would love to win this and get a couple things for the house. Thanks for the giveaway! would love to win would help with Christmas. I really could use this to help with presents for Christmas this year. I have been off work since February because my back has no discs left between several vertebrae and bursitis/tendonitis in both hips. About 2 months ago my fiance started having breathing problems and pain in her chest wall. They are still running a bunch of tests, but we both believe it is pulmonary hypertension. She also hasn’t been able to work since September. Like I said, the Amazon card would really help us get presents for my 13 year-old son for Christmas. Thanks so much for the great opportunity! I’d love to win and buy some Christmas gifts! Buying books is my passion. I love Amazon and my wishlist would be smaller with this! I would probably use the money for Christmas for my kids. Thanks for the great giveaway! I love shopping at Amazon! Thank you for the giveaway! I have such a huge wish list on amazon – this would help! I would buy gifts for my kids! Thanks for the chance! This would be perfect for holiday shopping! Toys and videos for the kids. I love shopping at Amazon – thank you! I would get a book for me and a gift for one of the children! Would love the GC to help with Christmas Gifts!! Thank you! this would help with xmas. I would use the gift card towards purchasing Christmas gifts for my two children Thanks!!! I love amazon. I shop there all the time! This would be very helpful for my Christmas shopping! Thank you for the chance to win! If probably buy a new blender. Thank you !!!!! LOVE AMAZON!!!!! I LOVE amazon. 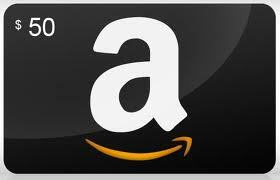 My hubby and I were just talking this morning what we would do if we won a large amazon gift card. ($5000) he said buy a TV (vetoed) and I said buy things we need as we need them. Schoolbooks, toiletries, gifts, ect. Men! Thanks for the great giveaway! Won’t it come in handy! I would love this for Christmas!! I love to shop at amazon. I would buy a couple of Christmas gifts with the $50 gift code. I love Amazon! I’m always getting my stuff there. I could shop on Amazon for weeks! I’d love to win, thanks for the chance. I love Amazon and have one more gift I’d like to get my boys for Christmas from there! Thanks for the chance to win! Amazon is the best! Thanks for the great giveaway! I’d buy Christmas presents…I don’t look forward to going to the mall around Christmas time, so Amazon is the perfect alternative! I’d love to win. Amazon is a great place to shop. this is great with Christmas coming up! Thanks for having this giveaway! It is going to make someone very happy ! Been shopping on Amazon this week, and would love to win this! Thanks for the chance. Thx for the fun giveaway! I’m going to buy a Furby! 9 minutes until draw, I’m so happy I found you!